I talk to strangers on elevators. Really. It drives my wife Kathy insane. You need to know that to understand how it was that I came to meet Emily Saldana, KB3VVE and her husband Keith Comp KC3FVN in person on a warm summer day in the middle of rural Pennsylvania. I’m an extrovert and I’m also attracted to people that exude energy. I know what you’re thinking. What in the world does any of this have to do with three radio operators, Emily, Keith and myself, and the Appalachian Trail. If you watch the daily activity on the American Radio Relay League’s National Parks on the Air Facebook page, it will take little effort on your part to see that Emily is an energy extruder. When the year-long National Parks or the Air (NPOTA) event launched on January 1, 2016, it immediately caught my eye. 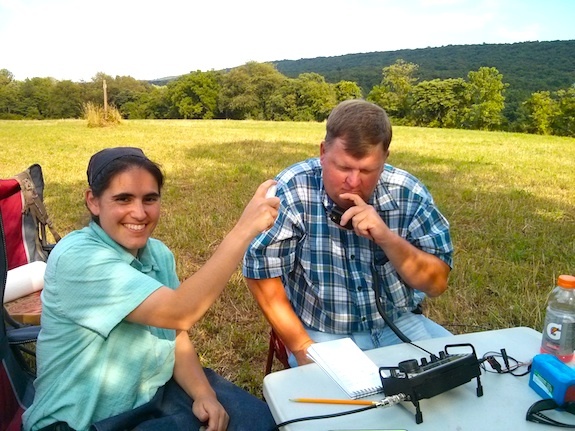 I’m one of the many amateur radio operators that loves to take tiny radios outdoors on hikes. Everything I need to operate almost indefinitely in the field can fit into a small daypack with room to spare. I call it stealth radio. I look like the average hiker on a trail, but in just a few minutes I can be on the air talking with someone else hundreds or thousands of miles away. Having dabbled in the Summits on the Air (SOTA) over the past few years, I instinctively knew that the NPOTA event would catch on fire faster than dry pine needles in a drought. The reason was simple. NPOTA rules made it far easier for an operator to transmit from a location. All an outdoor operator like me has to do is drive to one of the listed National Park sites, set up within the boundaries of the site, and contact at least ten different radio operators. Once you do this, you’ve officially *activated* that site. It’s not hard at all to contact ten different operators in most cases. Remember, you don’t have to hike to do an activation. Some radio operators have radios installed in their cars and trucks as well as an antenna already attached to the body of the vehicle. They can just drive to a park, and immediately start to transmit from inside the comfort of their vehicle. This opens the event to tens of thousands of operators who simply can’t hike for any number of reasons. Because many of the NPOTA units are somewhat close to one another in different parts of the nation, it’s quite possible to do one or more activations in a single day. Some of the operators participating in this event have activated six or more sites in a single day! That’s what happened the day I met with Emily and Keith to activate the Appalachian Trail in Shermans Dale, PA. Just hours before I had been over one hundred miles away and had activated the solemn Flight 93 National Memorial in Shanksville, PA.
Several months ago I saw on the ARRL NPOTA Facebook page that Emily was trying to get better at sending and receiving Morse code. Radio operators refer to this method of communicating as CW. CW is a short acronym for continuous wave. When sending CW, the operator breaks the continuous tone into short bursts of different length to create letters, numbers, punctuation, etc. Emily and I did a very short CW conversation on the air. We then started to schedule regular practice sessions. While these practice sessions were happening, I was planning to drive to my 50th grade school reunion in Cincinnati, OH. The event was to be held in the middle of July, 2016. It didn’t take but a few minutes to realize that I could drive through the southern tier of Pennsylvania and activate several NPOTA units on both my outbound and inbound treks. Emily and Keith live in south central PA.
That’s how it all started. 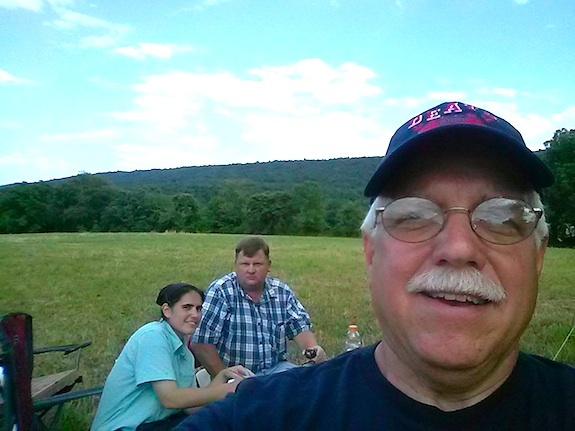 It didn’t take long for Emily to suggest that she and her husband do a joint activation with me next to the Appalachian Trail in a hayfield very close to where they live. It was a fantastic idea and I jumped at the opportunity. Emily and I met in the parking lot of a local pizza parlor and then drove the two miles to the hayfield. It only took us about fifteen minutes to set up a small table and two chairs just ninety feet from the trail. Fortunately we were in the shade of a lone scrubby tree that provided the necessary support for my 29-foot vertical wire antenna. We decided that I’d get on the air first since Emily and Keith had already activated this site months before on a cold winter’s day. When we were planning the outing it was decided we’d use my Elecraft KX3 radio, my 29-foot wire antenna and 9:1 unun, and my lightweight Bioenno Power lithium iron phosphate battery. Emily and Keith were to supply the shade. Using my marginal CW skills, it only took me about twenty-one minutes to contact fourteen other operators. Emily was kind enough to write down, or log, the contacts. I could have had many more, but decided to stop so that Emily and Keith could also officially activate the site. A few minutes after Emily was on the air transmitting and receiving CW, Keith showed up with much needed nourishment. 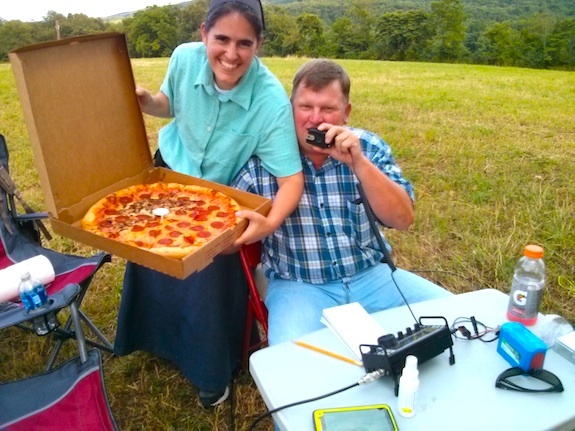 Pizza and radio waves go together like chocolate and peanut butter! Thanks Keith for the delicious pizza! Keith doesn’t do CW yet so he grabbed the microphone and started to talk to other operators from hundreds of miles away. At first he was having no luck. We discovered the radio was in the wrong mode. We were having so much fun laughing and joking we forgot to switch the radio from CW to voice mode. 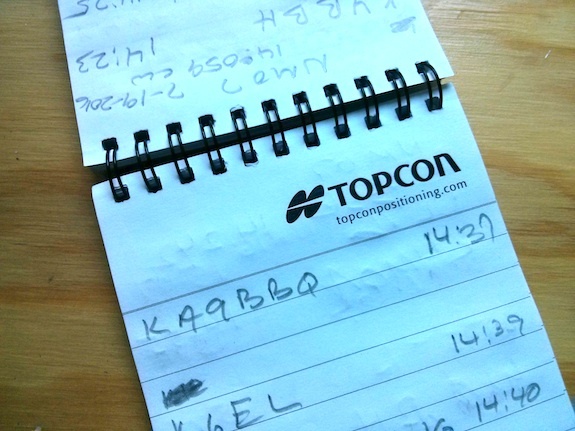 It didn’t take long for Keith to log his required ten contacts. The three of us had a wonderful time and were sorry it was time to pack up and go. Emily and Keith invited me to their local club meeting and we made it there with just about 10 or 15 minutes to spare. As I drove into the night to my hotel after I left the club meeting, I replayed the past few hours over in my head. It brought a big smile to my face because I had made two new friends. That’s what happens when you mix lots of laughter, invisible radio waves, slices of pizza and three radio operators in a hayfield. Many thanks to the ARRL and National Park Service for creating the NPOTA event that brought us three together! Each time I think I’ve syphoned the most pleasure out of the magical happiness machine of ham radio, I get yet another surprise. On Tuesday July 19, 2016 I found myself once again alone at the hallowed ground of the Flight 93 National Memorial. Little did I know that on this day, I’d help another operator achieve a personal goal. 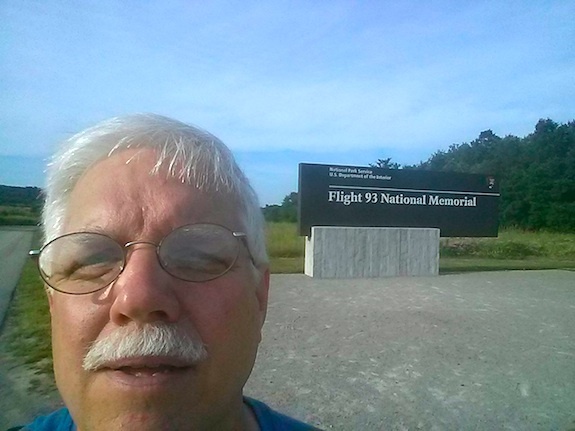 A week earlier I found myself at Flight 93 for the first time. I had come to do a National Parks on the Air (NPOTA) radio activation and decided to visit the Memorial Plaza before getting on the air. I walked away misty-eyed hoping I could honor the forty patriots who gave the ultimate sacrifice just under fifteen years ago at this very spot. I did a successful activation that day, but had to cut my time short because I needed to be in Columbus, Ohio by 5 pm. Many hours of driving were ahead of me. But on July 19, 2016, I had nearly three hours of time to help other NPOTA participants put the rare Flight 93 unit into their logs. It’s a challenging site to activate because it’s both a battlefield and a burial ground. The wounds here are fresh and deep. 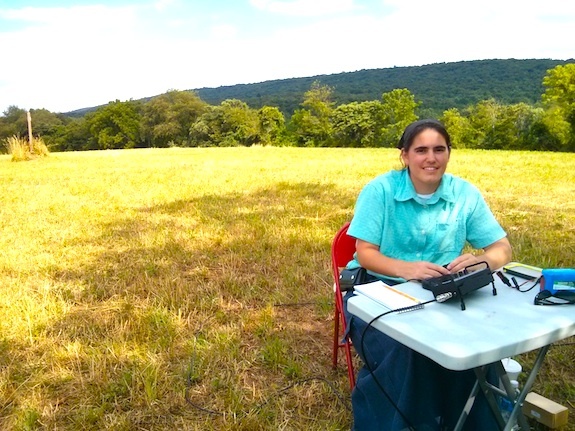 The National Park Service accepts radio operators to this site, but they prefer respectful setups as far away from people and parking lots as possible. As soon as I got on the air, many operators tried to call me at once. In amateur radio parlance, we call it a pileup. I was piled on for about two hours straight. I was using my Elecraft KX3 radio and a 29-foot wire antenna attached to a 9:1 unun. The KX3 has a splendid internal tuner that will handle this setup. I did both Morse code (CW) and phone (SSB). If you’re not an amateur operator, phone means talking through a microphone to other operators just like you might use your cellphone. Matt Steffen, KA9BBQ was one of the many operators who I contacted in the two-hour stretch. FIRST I thank you so much for the activation. Chasing the parks is a blast. I have been a ham for just over a year now and learning a great deal. Mostly self taught and having a great time. Learning CW now, having recently completed the CW OPS class, I find it both exciting and intimidating. Trying to tune my ear is difficult with everyone (seemingly) using the computer to send and receive CW the speeds they send is too fast for my brain to decode. Asked him what kind of key he was using and he snapped back, “I’m ALL digital.” I asked him “No key ?” He replied there is no need for that and went on to explain how he has 250+ confirmed DXCC mostly on CW with his Flex and his digital ham station set up. Being polite, and not being to impressed, I listened then thanked him for sharing and moved on. Digital has a place in this wonderful hobby for sure but in CW ??? I prefer to pursue and struggle to learn CW without the aid of a complete DIGITAL HAM station. Today I got the courage up to try to make contact. Yes, you were the first. So very sorry about that. Tuning around on 20 meters I heard your CQ at a speed I could copy and to my surprise a NPOTA site. So I took a deep breath and sent my call out and wow you came back to me with a report 5NN. Yikes now what ? Well I got nervous and I tried to send you your signal report of 5nn and my location IL then TU DE KA9BBQ – when I finished it sounded like a barrage of CW at a much faster speed and suddenly I felt out of place. I really believe we had a good contact but found my self being to nervous to touch the paddle again. If I missed out on the contact at least I tried right there will be another day to try again. Was my first attempt at cw as a rookie success or should I now start saving for that FLEX and digital station? Just kidding. I cut and pasted from my log book – below. RST: 59s/59r PWR: qrp Ant: ? GOD bless, safe travels, good luck and good DX ! With all the tension on the street I find chasing NPOTA and learning CW so very relaxing when I change out of my uniform. Spending time with the radio headphones on is a welcomed distraction from hearing how another one of us serving and protecting has lost their life. No soap box here – just saying I put my life on the line daily many, many times without a partner performing my job at the highest of levels while dealing with issues never shown on the news. In my environment I’m respected yet the stress and threat is so very real especially on my shift – from the hours of 11PM – 7 AM. I don’t know what more I could possibly add. Matt’s excitement about having his first official CW QSO was oozing from that email. Congratulations Matt! You did a great job and I heard all you sent. Here’s proof you’re in my field log for that day! I’ll have it up on the Log Book of the World (LOTW) in just a few days.